Chillies originated in the Americas but are now used all throughout the world to add flavour and heat to endless numbers of dishes. The flavour of dried chillies is quite different to their fresh counterparts due to the caramelisation of sugars that occurs during the drying process, creating a more complex flavour. They are used widely in Indian, Mexican, Asian and Italian cuisine. India is the world’s biggest producer, consumer and exporter of chilli peppers. Guntur, in the South Indian state of Andhra Pradesh produces 30% of all the chillies produced in India. Andhra Pradesh as a whole contributes 75% of India’s chilli exports. Chillies are used not only for cooking but have a large range of uses. Medically, Capsaicin is considered a safe and effective topical analgesic agent in the management of arthritis pain, diabetic neuropathy, mastectomy pain, and headaches. 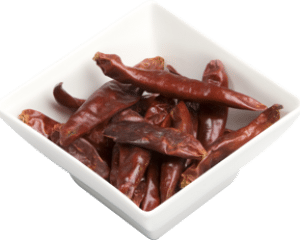 The flavour of dried Indian chillies is quite different to their fresh counterparts due to the caramelisation of sugars that occurs during the drying process, creating a more complex flavour. Our dried Indian Chillies Whole can be chopped up dried or soaked and re-hydrated.